Venus Williams' confidence caught up to her game just in time for the U.S. Open. The Wimbledon champion extended her career-high winning streak to four tournaments and 19 matches Saturday with a 6-2, 6-4 victory over Monica Seles in the Pilot Pen final. "I always felt I could play like this, but it is a lot of work getting to this level, especially for someone like me. I have to keep myself under control," Williams said. 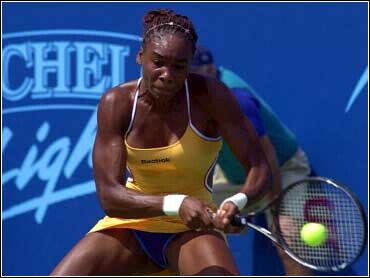 Seles has not beaten Williams in four tries. She said Williams, seeded No. 3 for the Open, is definitely playing like the world's best player since Wimbledon. "Venus is probably playing the best tennis on tour right now," Seles said. "You can't make as many unforced errors and you have to hold your serves because to break her on a consistent basis is very difficult." She beat Seles in their last tournament in San Diego and has two wins over Lindsay Davenport, including the Wimbledon final. Williams' last loss was in the quarterfinals of the French Open in early June, a 6-0, 1-6, 6-2 decision to Arantxa Sanchez-Vicario. "I've always had the groundstrokes and the serve and speed, but I never had the consistency on the big points," she said. "In the past I was defeating myself most of the time." On Saturday, Williams broke Seles three times in the first set and kept running down deep groundstrokes that looked like winners. None were more stunning than one in the final game of the match. Down 0-15, Seles had Williams pinned in the left corner and rifled a backhand crosscourt shot to a wide-open court. Williams was on a dead run before the ball was hit and fired back with a forehand winner down the line to go up 30-0. "I was just going for broke," Williams said. "I had no opportunities, except for that shot." "She just played an amazing shot," Seles said. "It is a fantastic point. As another player you are, `Wow, what a great shot.' But then you just go back and try to refocus." There wasn't much time left for that. The strongest server in the women's game then fired two straight aces at 105 mph and 114 mph to close out the match. She wound up with eight aces, to two for Seles. Her younger sister, Serena, the defending U.S. Open champ, was courtside for Saturday's match, and Venus said she wanted to set a good example. "Serena's a tough player and I want her to know that I am playing good tennis," she said. Williams said she had to tone down her power for the match because her shots had been spraying out all week. Her game, she said, still needs more tinkering before the U.S. Open. "I was kind of playing within myself," she said. "Right now I'm not adding enough topspin and forehand down low is one of my favorite shots. It's not really working for me this week, so I'm going to work on that. This week, going into the Open, I have to be serious." Her strong finish this year caps a season plagued early by injury. Tendinitis in both wrists kept her out of competition until May, and the Pilot Pen was only her seventh tournament. The limited play has kept her from amassing ranking points, so Martina Hingis is ranked on top. It also gave Williams time to think about her game. "I feel like I'm mentally prepared to play everyone," she said. "Since my injury, I've had time to think about just playing the match ... loving to compete." A confident Williams said she's preparing to be the top-ranked player on tour. "From what I heard it's tough to stay on top once you get there," she said. "So I started thinking that my preparation is coming now by learning to play consistently. When I get there it will be a good time because I think it will happen."